Dry-erase writing surface offers an open space to customize your planning. 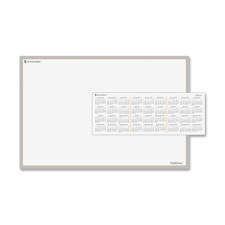 Erasable planning surface is easy to use and goes up in seconds. Simply peel and stick the self-adhesive backing on any hard flat surface. Setup requires no tools or hardware and causes no damage to wall surfaces. Remove with no adhesive residue. 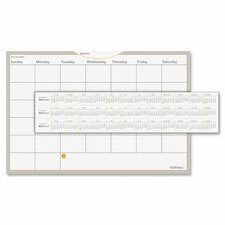 Dry-erase writing surface includes a self-adhesive reference calendar and dry-erase marker. Dry-erase writing surface offers a one-week, undated grid to customize your planning. 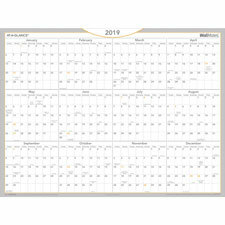 The weekly format includes unruled daily blocks, Monday-through-Sunday scheduling, and a place at the top to write the date range of the week. 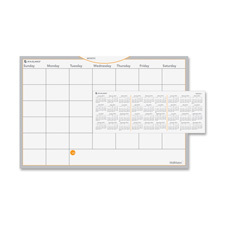 This erasable planning surface is easy to use and goes up in seconds. Simply peel and stick the self-adhesive backing on any hard flat surface. Setup requires no tools or hardware and causes no damage to wall surfaces. Remove with no adhesive residue. 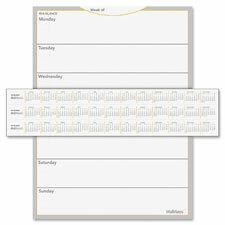 Dry-erase writing surface includes a self-adhesive reference calendar and dry-erase marker. Flint Toner offers the most comprehensive shopping experience on the web. Our shopping experts have drawn on their industry experience and insider connections to bring you the best collection of the products you can't live without, and the brands and products you love - all in one place. Apple, Brother, Canon, Compaq, Copystar, Dell, Dymo, Epson, Gestetner, Hasler, HP, Hewlett Packard, IBM, Imagistics, Kodak, Konica, Konica-Minolta, Kyocera, Kyocera-Mita, Lanier, Lexmark, Minolta, Mita, NEC, NeoPost, Okidata, OKI, Olivetti, Omnifax, Panasonic, Pitney Bowes, Primera, Ricoh, Risograph, Samsung, Savin, Sharp, Star Micronics, TallyGenicom, Toshiba, Troy, Unisys, Xante, Xerox and other manufacturer brand names and logos are registered trademarks of their respective owners. Any and all brand name designations or references are made solely for purposes of demonstrating compatibility or promotion and sale of those specific branded products.